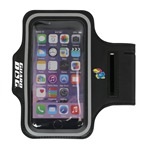 Take your phone with you with the Sport Armband from Guard Dog! These Officially Licensed Sport Armbands feature the Kansas Jayhawks logo and come with an adjustable Velcro strap. 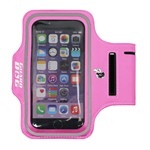 The Sport Armband fits phones with screens up to 5” and has headphone jack openings on both top and bottom. Each Armband is sweat-resistant, allowing you to jam to your favorite tunes while you work out.